Every coin collector, be beginner or advance, needs several coin collecting supplies to properly store and display their coin collection. Most importantly, these coin supplies will keep your coins from being damaged and preserved their pristine condition. These coin supplies will get you started on a lifelong hobby while providing you hours of enjoyment. The first and foremost supply that you will need for coin collecting is a safe means to store your coins so they will not get damaged. Most beginners start with the proverbial "cigar box" as a means to store their coin collection. Unfortunately, this does not protect your coins from damage occurs from the coins touching and rubbing up against each other. Therefore, the best bet is a holder, folder or coin album that is specifically designed to house your coins. The most popular coin holders are cardboard 2x2s. These are 2" x 4" pieces of cardboard with a hole in the middle on each side and clear Mylar plastic adhered to the inside. You place the coin on the plastic over the hole, and the holder is folded in half and stapled shut. Another popular and inexpensive coin holder is the coin flip. Inert Mylar plastic is used to construct these coin flips, and they measure 2" x 4" with a pocket on each side. The coin fits in one pocket, and a piece of paper with identifying information fits into the other pocket. The holder is then folded over to protect the coin from falling out and thus allows safe storage in an album page or storage box. Be careful when purchasing 2 x 2 coin flips to be certain that the plastic does not contain any PVC. If you decide to use 2 x 2 cardboard coin holders, you will need to staple them shut. Using a standard office stapler will result in the staple being crimped underneath the holder with two bumps from the staple protruding from the back of the holder. You can use a pair of needle nose pliers to flatten these bumps, but you risk scratching the coin with the pliers. A simpler solution is to buy a flat clinch stapler that presses the staple underneath the holder into the cardboard so that the staple does not protrude from the back of the cardboard holder. Another method of storing your coin collection is to buy a coin folder or album. There are many options for you to choose from. Coin folders only allow one side of the coin to be viewed, but they are very inexpensive and ideal for beginning coin collectors. 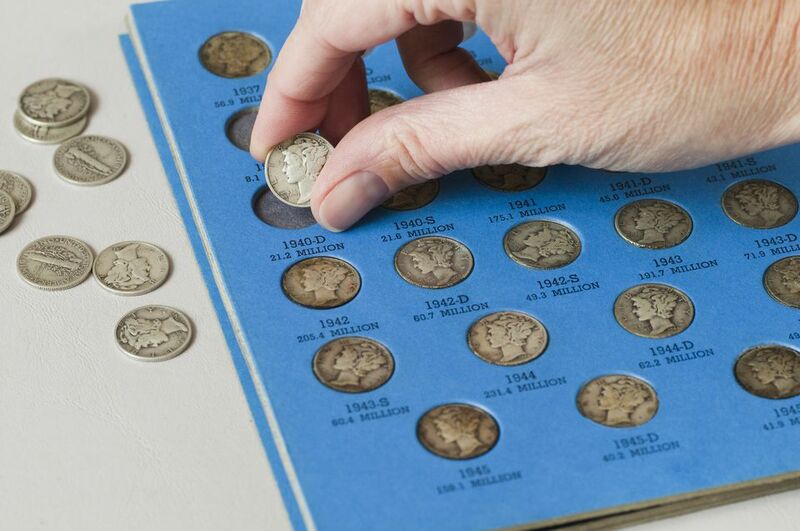 Intermediate and advanced collectors may want to look at coin albums that are slightly more expensive, but allow both sides of the coin to be viewed and provide additional protection by using plastic inserts that protect the surfaces of the coin. In order to properly view your coins you will need proper lighting conditions and a magnifier to help you see your coins better. The best lighting is incandescent lighting. Fluorescent lighting tends to be too soft and mild and may hide significant imperfections from you. Halogen lights on the other hand are too harsh and may call undue attention to minor blemishes on your coin. A simple desk lamp that uses a 75 watt incandescent bulb is ideal. I like to use two kinds of magnifiers. A hand lens which is usually 1.5 to 4 inches in diameter and has a magnification power between 2X to 3X. This allows a general viewing of the coin's beauty and overall eye appeal. For more close-up analysis of a coins surface a jeweler's loupe that has a magnification power between 10X and 15X is ideal. The first two books any coin collector should purchase are the U.S. Coins "Red Book" (A Guide Book of United States Coins) and The Official American Numismatic Association Grading Standards of United States Coins (ANA Grading Guide). The Red Book is the standard pricing guide for United States coins. It provides a brief history and description of all the United States coins ever minted. The other quintessential reference book is the ANA Grading Guide that provides a detailed description of every United States coin and how a grade is determined. The oils and acids from your skin can damage the delicate surface of any coin. This is especially important when handling uncirculated coins that have pristine surfaces. In order to keep the oils and acids on your fingers from contaminating your coins, gloves should be worn. Soft cotton gloves are preferred by most professional numismatists. An alternative to cotton gloves are powder free latex or nitrile gloves that can be purchased at any drugstore.